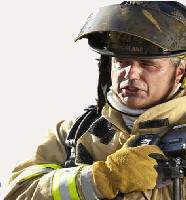 Volunteer Firefighters are typically called to action via Pagers. NEW ! Datalink's Elert can call volunteers to an emergency over a range of networks and personal devices in seconds. All records saved automatically to DBF. 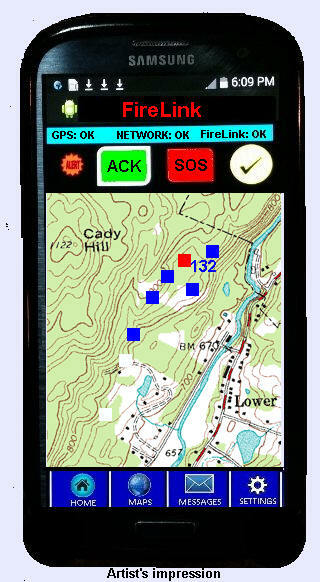 The Firefighters unit Includes an “emergency call button” for a firefighter in distress with GPS location and ID transmitted to the command post. Each firefighter’s location also appears on tracking map in command post. and can be relayed to other remote screens. When a 911 call is placed, the regional 911 dispatch centre will relay the call via email to the appropriate Volunteer Fire Department's 911Elert DataGate 3server (Cloud Server recommended). This may encompass a number of small communities served by a common regional 911 control center. A DataGate Hub in the 911Elert Server automatically relays the information to the volunteer Firefighters and/or one or more community Fire Chiefs. Alternately the Fire Station Chief can select the groups that will be called to the Fire Hall. All alerts are transmitted three times. 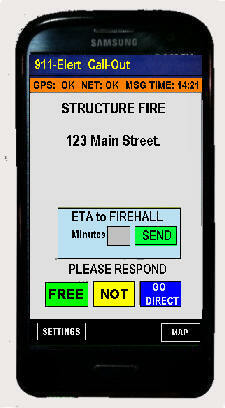 The Fire Chief has the added option to send additional text messages. The local Fire Hall and Volunteer Firemen must be equipped with either compatible portable radios such as Kenwood NX 5XXX series or HYTERA Digital radios, or Smartphones that can accept Cellular Emails or Text Messages. Datalink's 911-Elert can be installed as a stand alone system linked to a local 911 dispatch center or as an integrated multi-Network system also developed by Datalink as response to the major wildfires now becoming a yearly event due to the warming climate.